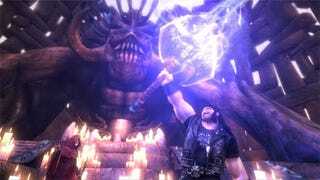 Brütal Legend's Rocktober release appears to be safely on schedule, as a Los Angeles Superior Court Judge has tentatively denied Activision's request to delay the game. The rival publisher sued developer Double Fine in June, claiming ownership to Brütal Legend. Whether the judge will ultimately rule in Activision's favor and deny gamers a face melting experience this fall still remains to be seen, however, as arguments from both EA and Activision's legal teams have been pushed back to next week. The Associated Press reports that Judge Craig Karlan told Activision attorneys he "can't say there's a likelihood of success here," but hasn't ruled on either side's competing lawsuits. As previously noted, we think the case should have been thrown out of court based on superior wit. But our version of the legal system would probably involve something Thunderdome-esque as well. Not sure you want Judge Kotaku on the case.